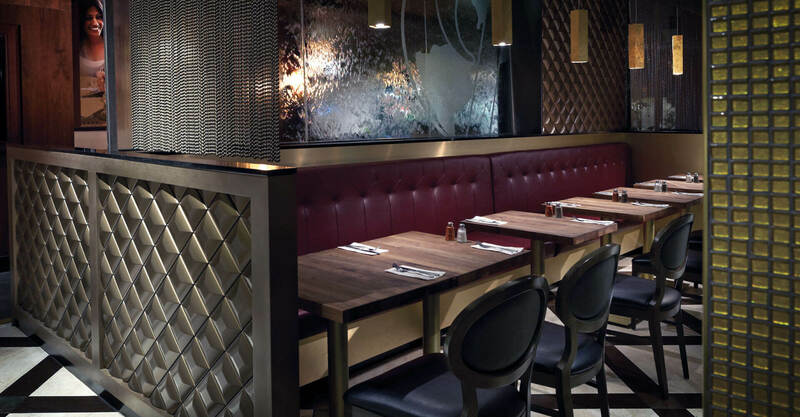 Paramount Fine Foods was more of a suburban restaurant brand when they came to us late in 2014 to come up with an upmarket concept that would be their entry into the posh Yorkville community. 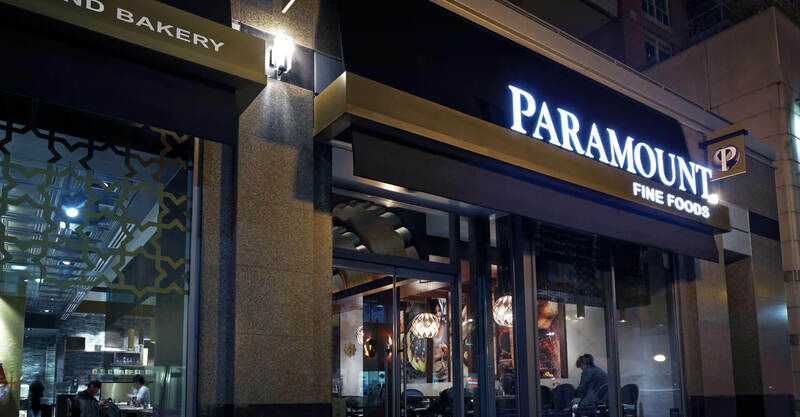 In order to cater to a more affluent clientele base in a more premium location, Paramount needed to elevate their brand and reconsider their existing service and seating model. 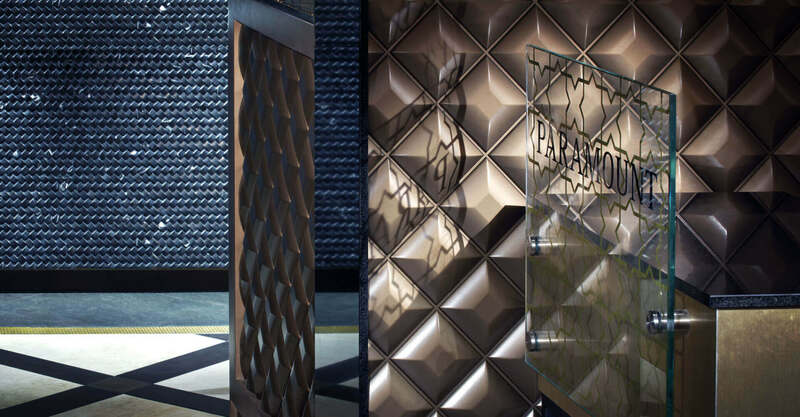 The Yorkville restaurant was to be a new vision of Paramount, reimagined and refined. 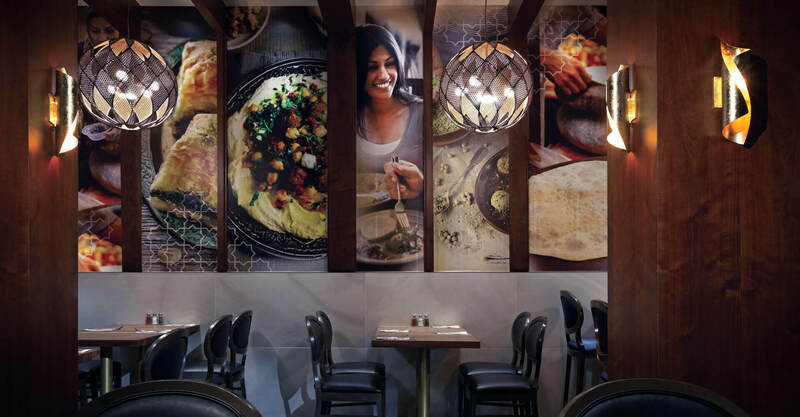 Being first-to-market in area in the the middle eastern fine restaurant category, the team at Paramount wanted to cater to traditional clientele, but also encourage trial. It was important to them that the space have middle eastern cues, but in an execution that was contemporary and inviting to everyone. 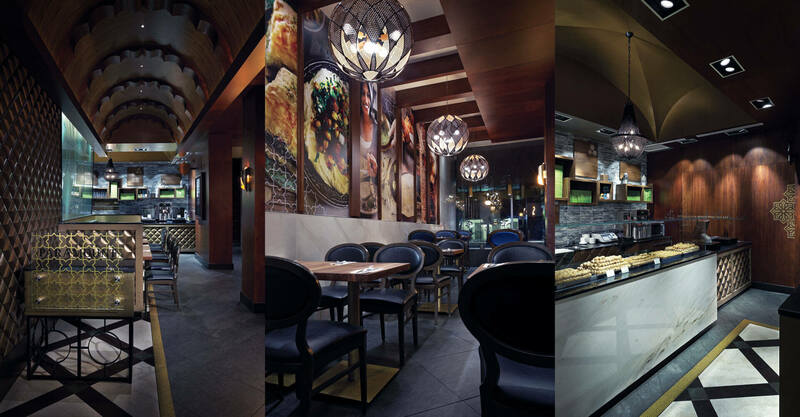 The space selected for the Yorkville restaurant was an excellent location, but demanding to work with. The space was previously occupied by two different clothing stores, with condos above and parking below. Massive columns needed to be integrated into the layout, and barriers from the condos above, HVAC and plumbing needed to be worked into a ceiling that was designed to feature 6 different ceiling types. There was a lot to accomplish in a small footprint: with the new concept earmarked to become a destination for lunch, dinner, and takeout, it was imperative that we deliver a high seat count in a small space. While existing Paramount locations are categorized as fast-casual, this location required sit down menu service to effectively cater to the different clientele. 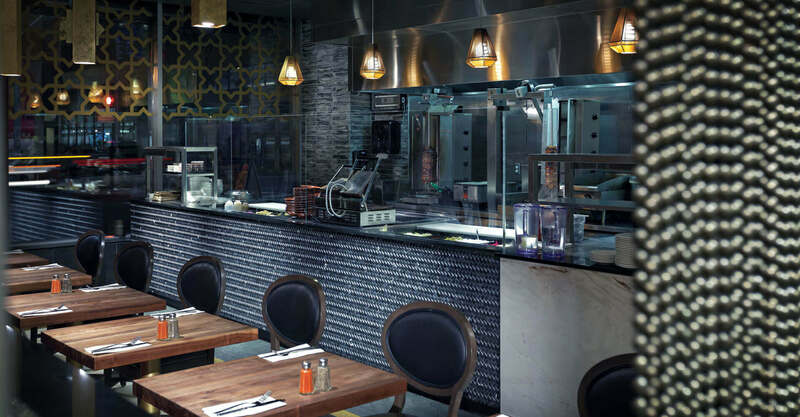 The Paramount team also wanted to maintain the kitchen theatre that is a mainstay of their existing locations, and be able to offer takeout efficiently. 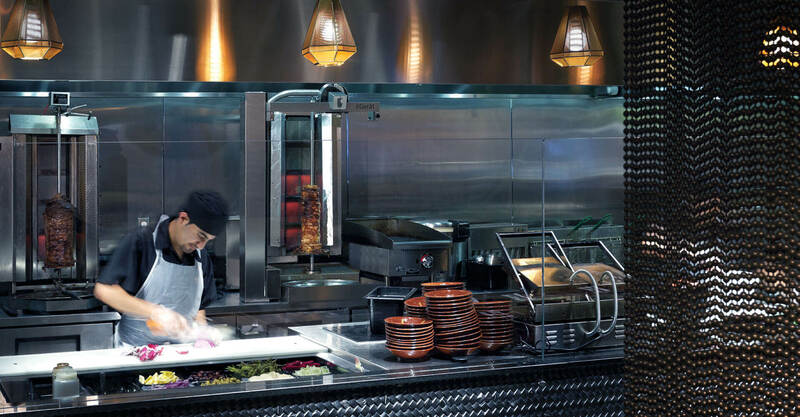 In order to accommodate the high seat count, we condensed the kitchen, sourcing some new, smaller equipment to free up space. The limited footprint instantly created more intimacy at the tables, as most of the seating is for small groups. 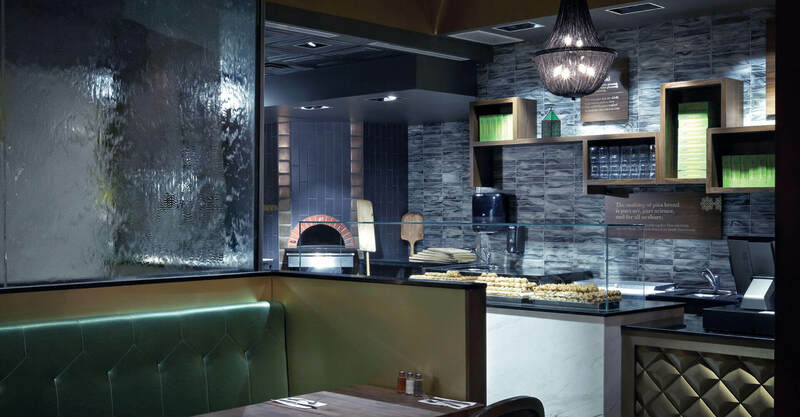 The architectural detailing included creating smaller spaces throughout using archways giving the environment historic middle east references in a contemporary execution. The waterfall, common to all Paramount locations, is retained in this space as the main feature. Three-dimensional formed panels feature natural walnut to bring in warmth, and the high signature lighting provides both form and function. The floor detail looks like carpet to soften the hard surface, but provides a cleaner and more practical flooring. Marble counters, and marble tiles on the wall raise the profile of the concept. The ceiling heights were one of the biggest challenges, but despite the difficulty, the detailed barrel vault that travels the length of the space, back to the POS and beverage area, is a signature element that invites guests in. The groin vault directly over the POS and beverage area is covered with metallic paint, and the double groin vault over the seating creates intimacy and segmentation. Despite the more luxurious finishings, we worked with the builder to come up with cost-effective fabrication while maintaining quality finishes and detail. We also developed a custom graphics package that differentiates the brand, creates an inviting environment, and stimulates brand loyalty. We took excerpts from old world proverbs and weaved them into the integrated package. 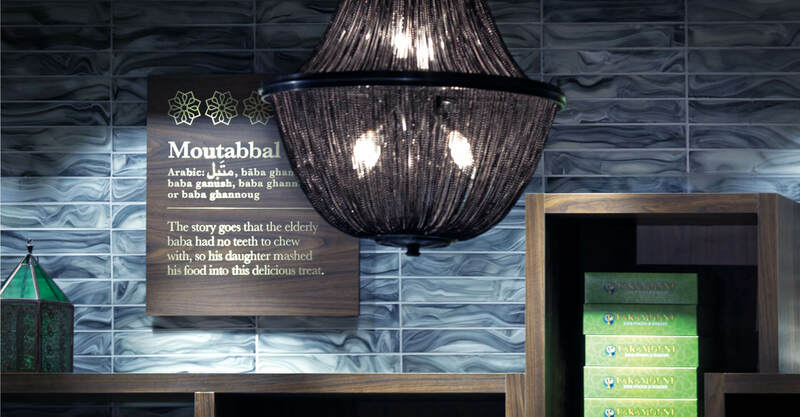 Again, Telling the stories of the food, Moutabbal and Hummus, bridges the gap between Middle Eastern and North American culture; it both educates and grounds the concept. Paramount Fine Foods opened its doors in Yorkville in May 2015.